Editor’s note: This article was also published on the Acumen Fund blog. I just got back from a three day trip to Bihar, India where I was visiting Acumen Fund Global Fellow, Neha Kale, as part of my work on leadership at Acumen Fund. 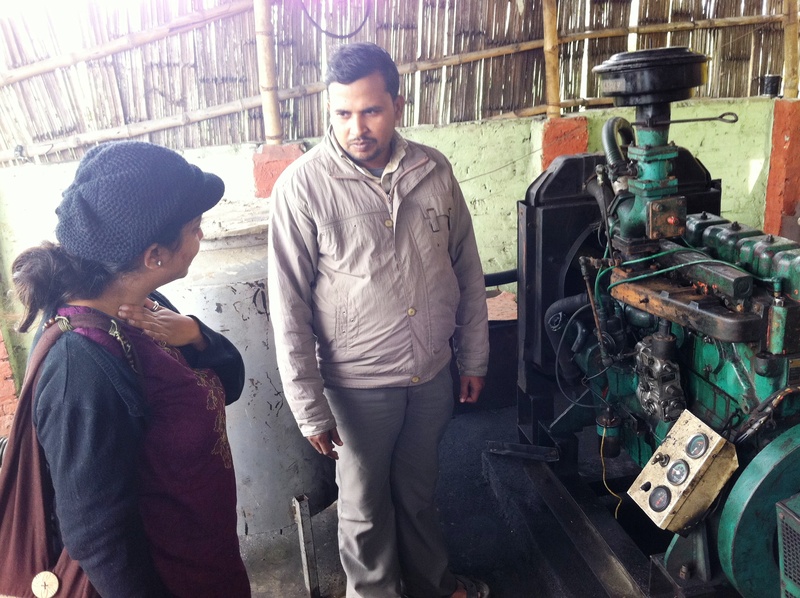 Neha is currently working for Husk Power System (HPS), an Acumen Fund investment that uses rice husks to electrify rural villages in India (check out how they do it here). Husk is located in Patna, Bihar the poorest and darkest state in India and probably the place most in need of light. Patna is a few hours flight from Mumbai so I hopped on the plane and was greeted in the airport by Neha. She quickly scooped up my bags and threw them into the back of a faded red SUV, making sure we did not waste too much time as we had a seven hour drive to Tamkuha, where the first Husk plant was established. The roads to Tamkuha were a lot better than I had imagined as Mr. Kumar, the new governor of Bihar has focused on infrastructure, but let’s just say we were not on an Emirati super highway. We arrived in Takuha late at night shivering from the cold (there was no heat in our car) and wrapped ourselves up in blankets in the hotel close to the small space heater. As we drifted off to sleep my mind kept wondering how the villagers managed to stay warm in this temperature. We awoke the next morning and drove about an hour to the first village. The roads were filled with potholes, bikers, tuk tuk’s, and running children filled with energy and laughter. Husk Power Systems impressed me on many levels. The first was leadership. During our drive up Neha (pictured below) kept telling me how inspired she was by Gyanesh. He is the entrepreneur behind HPS who achieved the highest levels of education and decided to use it to build HPS. His deep commitment to improving the lives of the people in his home town was truly admirable, “he is like a celebrity here,” she said. She also talked about his incredible flexibility as a leader who could work and understand problems and opportunities at a plant level and then move fluidly back to the strategic level. This is critical for someone working in social enterprise because if we truly want to change systems we must value the voices of the poorest as equal to those of the richest. Gyanesh not only knows this but has built a business around it. The second thing that blew me away by Husk was their significant investment in talent. While we were still in Patna I met Rama, an LGT Fellow who was placed at Husk for a few months but ended up staying for two years. Rama has helped develop Husk University, a training institute that teaches local workers the technical skills necessary to work at a Husk Plant. Each plant manager spends two weeks with a trainer at the Husk plant and then two weeks at Husk University learning the technical parts of the systems in case it breaks down. I can’t tell you how important this is as I have seen many systems set up in villages by outsiders that break down and no one knows how to fix them. But what is incredible is that Husk is thinking about how they can expand their university model to more people who work at different organizations, another potential revenue stream, amazing. The final thing that impressed me about the Husk team was that they just kept showing up. Working in this sector for almost 10 years has taught me the single most important thing for an entrepreneur is trust. What makes HPS unique is that they set up physical infrastructure, provide maintenance, hire local workers to manage the plant, and provide ongoing training to their workers. This type of robust business investment goes a long way in a rural village. I am firm believer we have a lot of the solutions, but just lack the trust and business models to deliver them. Husk has set up 84 plants so far serving nearly 200,000 people. But at the end of the day, Husk is doing an incredible thing; they are responding to a demand and having dramatic impact on the lives of the villagers thought their work. But how do we quantify it? Esther Duflo and the Poverty Action Lab have developed an incredible tool in their randomized control trials, but how do we bring this work to the majority of high impact social enterprises to really understand how to get better and smarter at what we are doing? I see a real need to convince more donors to invest in impact measurement. As we began our long trip back home and I watched the beautiful bucolic villages fade into the distance Neha said, “I think I might move up here for part of my fellowship. Gyanesh told me it will be really hard. I can handle it”. I have no doubt she could. Then I thought about what Gyanesh told her and remembered the hard part (reflecting on my time living in a rural village in Senegal). The hard part is the moment when you live in the village long enough to really feel and touch the impact of poverty; when your friends are unable to educate their families, their children die of preventable diseases, they cannot get access to markets, and are constantly manipulated by middle men. The hard part is when you realize how great the problem is and how your work and sacrifice can feel so insignificant. This hard part is the thing that awakens me every morning and motivates me every night.